On 23 and 24 September Unison's South East region held their 'strategy weekend' for 2016 in Woking, Surrey, involving around 70 activists. BFAWU conference 2016: "A council of war"
The BFAWU bakers' union conference 12-16 June in Southport felt like a real council of war. This is a union with 20,000 members - that is numerically smaller than others - but huge ambition to defend them at a time when it is under siege from the food employers who want to protect their profits. Day of action against poverty pay: £10 now! 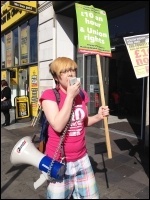 Chants demanding a £10 an hour minimum wage rang out through Wakefield city centre on 14 April. Thousands of teachers marched through London on 23 March against Tory plans to force all schools to become academies. 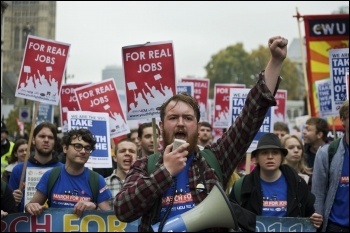 Thousands more marched in other cities across the country, writes Paul Callanan Socialist Party London. Some workers will be excited for a pay rise in April as the National 'Living' Wage comes into force. But is it really a great deal for workers? Or is it fool's gold? 'Living wage' lie: fight for £10 now! Join the fight against poverty pay and zero-hour contracts! A change to law in New Zealand has outlawed zero-hour contracts. Tory treasury minister Matt Hancock (right) said under-25s are not "productive" enough to deserve the minimum wage. The government's new 'national living wage' - which is not actually a living wage - is only for workers over 25. Young and angry? Whether you are studying, working or unemployed in Britain today, you come up against the Tories' agenda. Osborne attacks youth... we take to the streets! The budget saw vicious attacks on huge sections of society. But one group particularly hard hit was young people. Read reports of protests as we hit the streets to fight back. NSSN conference 2015: "We could stop austerity in its tracks"
Militant trade unionists from across the country gave inspiring accounts of strikes and struggles against austerity. Britain needs a 24-hour general strike. The Tory chancellor's new spending cuts will hit young people hard. Join young activists in towns and cities across the country to protest on 8 July! Tories threaten young people's welfare, housing and education: Sitting in my first A-level economics lesson a year before US bank Lehman Brothers declared bankruptcy my teacher said: "before you finish this course the economy will have crashed"